I’ve just spent a few hours researching some wines Susan and I are tasting next week. Well, attempting to research would more appropriately describe this exercise in frustration. I’m still astonished how many winery websites are hard to find, poorly laid out, and then give little or no information. Sometimes I dig through page after page after page and finally discover a two-line tasting note – how exciting. To all you wineries, if you think this amount of information will have wines flying off the shelves, think again. First of all, by the time most consumers are looking up a wine on the Internet they’ve already tasted it, so they’re after more detail than “black cherries and leather.” And could you include just a few words on your different vintages? Your 2001 tasting notes are getting a little dated. Besides, I’m sure your 2006 will taste different – different weather, different harvest conditions, different wine. How about a little technical information? French Oak or American Oak for example. A few lines covering pH, harvest dates, Brix at harvest, and residual sugar would be nice. Wine geeks will love you and talk up your wines – free promotion. I’d also think you would have your labels available for download – after all, your design person’s already done the graphics in digital format, so just get a copy. Buyers could then print the label and take it to their favorite store as a reminder of what they’re looking for. Wine reviewers would be able add a label to their review or blog – more free promotion. People could share copies with their friends and family: look at this great wine I just found. Even more free promotion. People viewing your site aren’t usually there to read all about the owners and how wonderful they are – at least not at first. Surprise – top of most people’s hit list are the wines themselves. What grape varieties? What quantities in your Bordeaux style blend? Can we have a little story on the style of wines you are trying to produce? Who is the winemaker and what’s their philosophy, experience, and technique. What does your winery look like – a picture or two might be nice especially for the folks buying your wine who live across the country. Oh, and some way of getting a hold of you would be nice – an email address or phone number would be cool. How can you except to answer questions – like “where do I buy your wines?” Or maybe you just like seeing your wines sitting in the warehouse. None of this actually takes that much effort. Really, it doesn’t. All you need to do is spend a little time and money on your website to make it stand out among the rest. If you want to see what I mean, here are links to a couple of websites that get it right. Arrow Leaf Cellars in BC’s Okanagan has a site that’s easy to negotiate and includes a contact list, newsletter, pictures of the vineyard, and a great tech sheet. There’s even info on screw caps with a link to the New Zealand Screwcap Wine Seal Initiative – just in case you haven’t been converted yet. Down under, Peter Lehmann Wines has another fantastic site – history, descriptions of the area, info about the winemakers and the wines. After spending time on the site, you want to buy rush out to the store and buy a bottle or two. And to the winery in Australia who will not put info on their web site because it is too “techie,” it’s time to get with the Digital Age. You say you’d rather have people come to the cellar door to get info than surf the Net. Yeah, right. I’ll just hop on a plane from Canada right away. Lots of luck selling wines in our local market and no reviews from this quarter. I confess, I have a severe love/hate relationship with the web. I admire Frank’s ability to search through layers and layers until he comes up with some nugget of information, but I certainly don’t share it. No results after a couple of Google searches and I’m on to something else. And sites that give me no contact information put me into orbit – Frank usually doesn’t even bother telling me about them any more because then he has to listen to my usually loud, always colourful verbal tirades. However, one interesting thing did come out of his visit to the “We don’t believe in an Internet presence” Aussie site. Our debate on whether the owner was simply stupid or was being blatantly arrogant was lively, thoroughly entertaining, and will certainly keep them at the top of our “Do Not Visit or Buy From” list for a long, long time. FYI: arrogant won hands down. 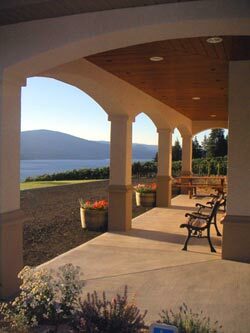 Note: Photos show the Arrow Leaf Cellars’ vineyards and porch area. Wine bottles show Arrow Leaf’s Zweigelt and Peter Lehmann’s Semillon. Enjoy. This entry was posted in Arrow Leaf Cellars, BC Wines and Wineries, Peter Lehmann Wines, Semillon, Zweigelt and tagged Food, Oak, Peter Lehmann, Peter Lehmann Wines, Recreation, Wine, Wine tasting, Zweigelt. Bookmark the permalink. Great write-up of the limitations of winery Web sites. Sad thing is that 3 years later, most of these observations are still valid. You may want to copy and paste this into a brand new post with perhaps a few updates. Very valuable stuff!